Lustre Mist Furniture cleaner and polish cleans as it waxes and polishes. Buffs to a high luster when used regularly. Treats the surface with a protective wax coating that resists grime, stains, and water spotting. 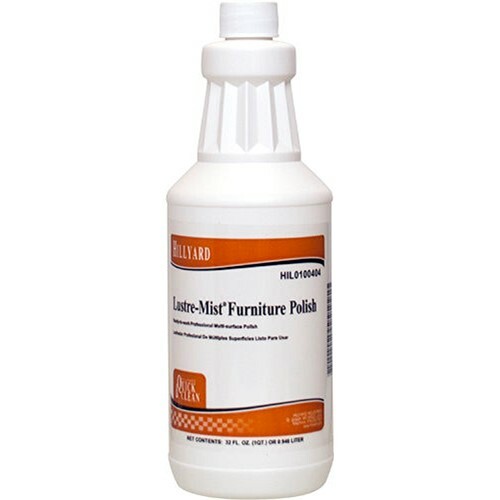 Use on wood and steel furniture, stainless steel, Formica, vinyl, ceramic, and vinyl upholstery. Lemon fragrance. Ready to use. Cleans as it waxes and polishes. Buffs to a high luster when used regularly. Treats the surface with a protective wax. Case Specs: Twelve one quart containers per case, sold as one quart container.